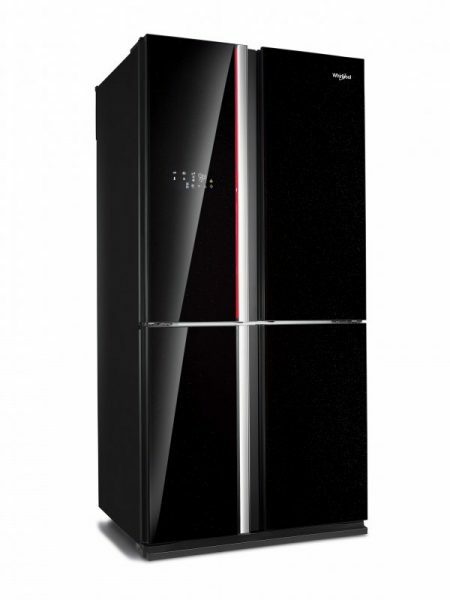 Whirlpool, manufacturer of major home appliances, has launched Carbon Black Series of premium refrigerators. Whirlpool Carbon Black Series Refrigerators come in two formats – Top Mount and French Door Bottom Mount. Both the formats boast of one of its kind Hybrid Cooling Technology which maintains food moisture content and ultimate freshness over a long period of time as stated by Whirlpool. These refrigerators are powered by advanced Japanese Inverter Technology and the 2 Door model provides precise and powerful cooling through its 36 compressor speed levels. With 25.2 decibel, the appliance operates at near zero noise level. Large capacity of 585 L provides sufficient space to accommodate day to day requirements. A special compartment, Fresh Room, allows storage of all the delicate foods, leaving them fresher for longer. The classic French Door Bottom Mount in a 4-door format is a canvas of seamless, minimalistic black glass doors, Touch UI panel and ergonomically designed Intelligent Glow Bar that creates a stunning and exclusive look. Designed for modern lifestyle, this refrigerator brings home smart technology that lets consumer experience 4 types of ice at home. This Refrigerator is a crystal clear ice making machine. The beautiful Matrix Touch UI controls plethora of features like ice making indicator and self-cleaning ice tray which make this refrigerator the ultimate ice making machine. Available in 678L, it is a true blend of artistry, grandeur and functionality. Currently the products are available in major retail outlets in select cities – Delhi, Mumbai, Bangalore and Chandigarh followed by phase wise launch across Pan India.